Nowadays, there’s basically an app for everything. 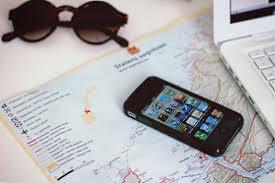 We’ve compiled some of our favorite FREE iPhone travel apps to help you have the most successful trip possible! TripAdvisor allows users to browse traveler reviews, photos, and maps. It assists with options for airfare, hotels, and restaurants! TripAdvisor also offers an app for offline city guides. Everyone wants to find the cheapest flight and Skyscanner aims to make this happen. The app scans and compares millions of airlines and flights to help you get the best deal. They link you directly to the airline or travel agent for the easiest experience possible. If you don’t already have Wunderlist installed, I highly recommend it. This nifty list app allows you to share your to-do lists with others, delegate tasks to certain people, attach documents, and set reminders. It syncs between phones, tablets, and computers and notifies users when another person on their list has completed a task. We use it to manage duties here in our office and it would be an incredible tool for planning trips, especially if you’re traveling with others. Seasonal Cities provides the only range of seasonal city guides in the world. Right now limited to 11 cities (Barcelona, Berlin, Istanbul, London, Moscow, New York, Paris, Rome, Shanghai, Sydney and Tokyo), the guides are written by journalists who actually live in that city. A weather function has been incorporated as well, to suggest venues accordingly. Whether you drove your car to your destination, you’re renting one, you’re using public transportation or walking, getting around in an unfamiliar area can be a struggle. Try these apps! GateGuru is an excellent app for those traveling to new airports. It gives you real-time flight status with push notifications, terminal and gate arrival and departure info, airport maps, food and amenity info/ratings, and last minute rental car bookings. I wouldn’t miss out on this app if I was a frequent flier! Got a long road trip? Not acquainted with your area? Try iExit, a tremendously helpful app that tells you what’s at upcoming exits when you’re on the highway. No more waiting until you see signs to decide where to eat in the next 30 seconds. Gasbuddy is another app to always have on hand when you’re driving (great to use where you live too!). It tells you where to find the cheapest gas! Traveling may mean not always having a wifi or network connection. Don’t get lost in a foreign place without a map! Download City Maps 2Go for wireless access to detailed maps, in-depth travel info, popular places, and tips. Don’t let language barriers stand in the way of your perfect trip! If you’re traveling to a place with a foreign language, you’d better study up! Duolingo is an amazing tool for actually (really!) learning languages. You won’t just learn basics or skim through simple phrases with this app. Users progress through daily lessons and are given points as they learn and successfully complete each section. Currently offering Spanish, French, German, Italian, Portuguese, Dutch, Irish, Danish, and Swedish languages, plan ahead and start mastering a language for that big trip today! Okay, so maybe you didn’t learn every word as you got ready for your trip. Not to worry, iTranslate and Word Lens have your back. iTranslate serves as a dictionary, as well as translates phrases and features voice input and output. If you can’t read a sign, take a picture of it and Word Lens will translate it for you! Food, fun, and other stuff! OpenTable helps you make reservations at restaurants in the US, Canada, and Mexico. You can search restaurants by cuisine or location and narrow it by price, rating, or distance. And it let’s you see where available tables are so you can choose a place effectively. If you feel a bit domestic or want to save some money by cooking yourself, try the Favado app. This awesome grocery story app compares sales and prices of all the grocery and drug stores around you. Not really sure what you want to do or have some free time? Viator points you to the best tours, activities, and attractions based on your location. If you’re like me, you love to update all your friends and family on your adventures. Storehouse is a fun app that combines photos, videos, and text to create a story. These cool little stories that you create can be shared on blogs and social media. Quintessentially Lifestyle opens the door to all the insider knowledge of the best bars, clubs, hotels, and spas around the world. Go enjoy the nightlife! Traveling doesn’t always make for the best sleep conditions. Rain Sounds HQ makes sleeping in unfamiliar (and sometimes uncomfortable!) places a little easier with 70 unique sleep sounds to choose from so you get the rest you need to explore and do things on your trip. Now that you’re ready, go have a fantastic adventure!